On 26-th of November 2018 at the State museum of the State cultural centre of Turkmenistan was carried out methodological conference «The meaning of a digital network for the development of the museum business». Representatives of all the provincial museums of History and Local Lore, metropolitan and some regional museums participated in this conference. The was carried out a conversation about importance of introduction of modern computer technologies, which has been mentioned at video selector meeting by the honourable President of Turkmenistan Gurbanguly Berdymukhamedov. Now the Internet is widely used in the activity of the State museum. The museum Internet site (museum.gov.tm) is in action. This site is also successfully used for services for visitors. They regularly acquaint the news occurring in the museum, the events, new exhibits, exhibitions. Also the site is used for information, it is possible to know the address of a museum and how to get it. In recent years many tourists visit the museum. They learn the information about museums on a site of the State museum and then set them as an object to visit it. At the conference the manager of the State museum of the State cultural centre of Turkmenistan, candidate of historical science Ovezmukhammet Mammetnurov concentrated attention about transition of museums to the centralized digital network. 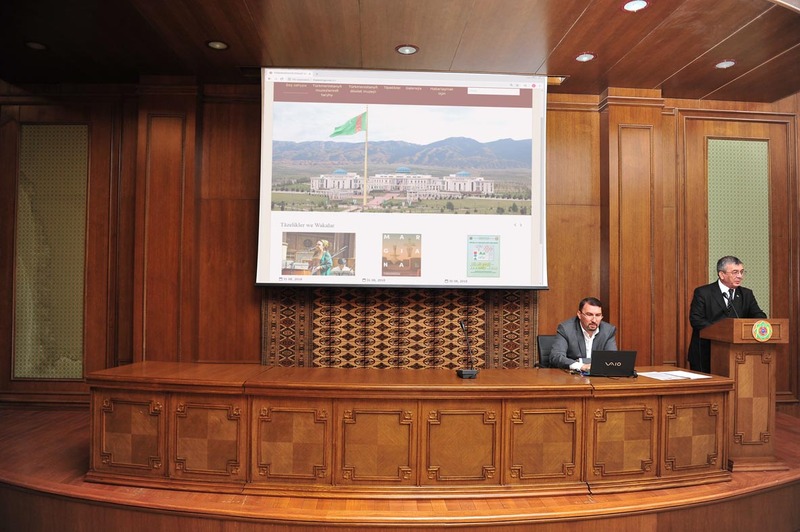 The place on this theme was also given to the deputy director of the State museum V.Baratov who has told about experience of the State museum on introduction of the Internet and a digital network. All those present at conference have supported this scientific method.